Oktober is almost gone, but we wanted to close this month of sausage with a shout to one of our favourite new dogs on the block: the Scottie Dawg, brought to you by Brewdog. It’s a big, beautiful, smoky beef hot dog that we make at Native Breeds from well-marbled Hereford brisket. 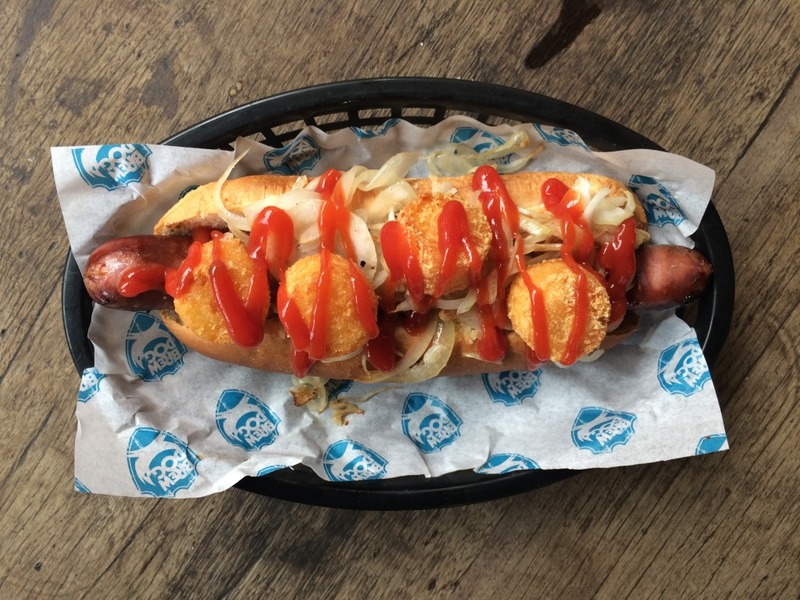 Grilled to golden goodness, and topped with pickled swede, grilled onions, bacon, and tater tots (tasty little one-bite hash browns; and THANK YOU, Bates and Bubbledogs, for championing the tater tot in Britain), it’s the full Scottish hot dog. America by way of Aberdeen! You’ll find the Scottie Dawg on the menu at Brewdog Camden, Shoreditch, Shepherds Bush, Cardiff, and Manchester. Stay tuned for Liverpool. And what’s up with the word “dawg”, you ask? Owen explains, “it doesn’t matter whether you have Matt’s New York accent or Bates’ South Carolina drawl, a dog is a dawwwg both ways”. A full Scottish hot dog. BONUS! As we pull together our hot dog tech blog, here’s a tiny little teaser on how we make them out West. See you in November! Beef : Mince : Chop : Rack : Cook : Dawgs!